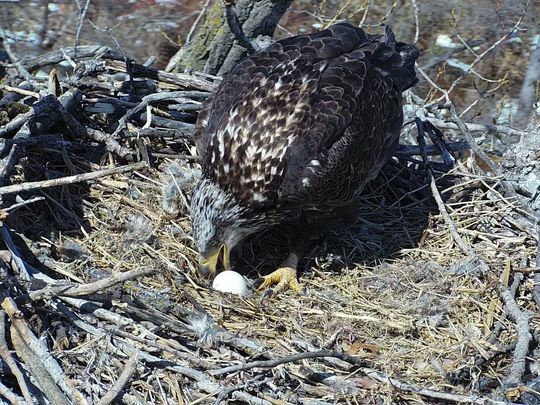 The last egg on our EagleCam nest met its demise yesterday. A juvenile bald eagle, likely a 3-year-old bird, spent roughly two hours in the nest. The bird was obviously looking for an easy meal and found left over carrion to pick at. Then it discovered the unattended egg in the nest. After rolling it around a bit, it finally grasped the egg with its talon and crushed the shell. A close-up in the video shows that the egg was not developed and was mostly liquid (albumen) and yolk. The juvie consumed the inside of the egg, which provided much needed protein and nourishment for this young bird. For the previous two weeks, the resident adult eagles had been spending less and less time at the nest. The final egg sat unattended for many hours at a time, signaling their intuition that it wasn’t viable. All three eggs were laid in late February, which meant that the last week in March would have been hatch time. Leading up to that week, the pair diligently defended their nest from several adult and sub-adult challengers. Disturbance to the nesting pair at this delicate stage of egg development, proved to be too much for the eggs to successfully develop. The female with her new mate attempted to defend the eggs, but she was forced to leave the nest to find food for herself. The new male brought in food occasionally, but the female had to compete with the male for tidbits, as he was reluctant to share his cache, forcing the female to hunt for food and leave the eggs. Though the male sometimes stayed with the egg, he didn’t incubate it until it was too late. We suspect the new male was a first-time nester, learning from the female how to place sticks, share food and incubate the eggs. All of these nesting responsibilities are typically shared by a nesting pair. The energy expended to lay eggs, defend the nest and find food all combined to deplete the female of her ability to adequately incubate the eggs. In addition, our Minnesota “spring” has been a challenge with wet, cold and very snowy conditions. It has been a challenging year for all of our avian friends, eagles are no exception. The female at this nest has successfully raised 10 chicks in the last six years, which is remarkable, bearing in mind all circumstances. The experience of watching and learning from these eagles on camera has been phenomenal, and we cannot thank you enough for your donations in support of this, and all other Nongame Wildlife efforts. As long as the resident eagle pair and other birds and critters continue to visit the nest, we will leave the camera on and watch their behavior and appreciate this incredible gift of nature. In case you are feeling sad or dreading nest withdrawal, you are in luck! Our pair of peregrine falcons has laid eggs and is now incubating. You can revive your excitement in anticipation of new, fuzzy raptor chicks in the coming weeks! Watch the falcon cam here.